Water is the key to life on Earth. Scientists continue to unravel the mystery of life on Mars by investigating evidence of water in the planet’s soil. Previous observations of soil observed along crater slopes on Mars showed a significant amount of perchlorate salts, which tend to be associated with brines with a moderate pH level. 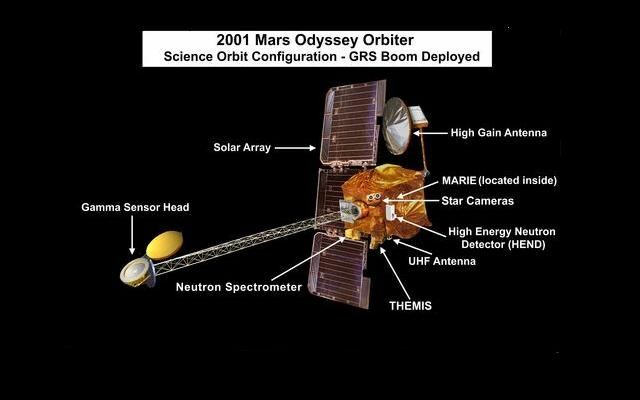 However, researchers have stepped back to look at the bigger picture through data collected from the 2001: Mars Odyssey, named in reference to the science fiction novel by Arthur C. Clarke, “2001: A Space Odyssey,” and found a different chemical on Mars may be key. The researchers found that the bulk soil on Mars, across regional scales the size of the U.S. or larger, likely contains iron sulfates bearing chemically bound water, which typically result in acidic brines. 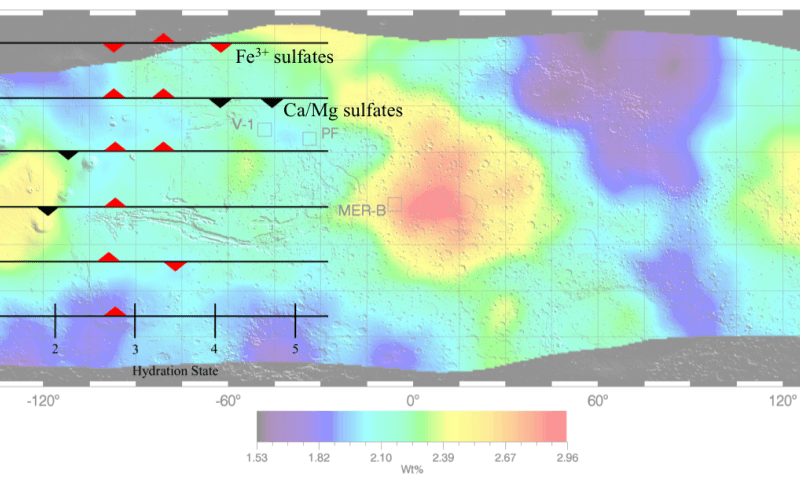 This new observation suggests that iron sulfates may play a major role in hydrating martian soil. The researchers considered several existing hypotheses in the context of their overall observations, which suggest a meaningful presence of iron-sulfate rich soils, which are wet compared to Mars’ typically desiccated soil. This type of wet soil was uncovered serendipitously by the Spirit Rover while dragging a broken wheel across the soil in the Paso Robles area of Columbia Hills at Gusev Crater. Key hypotheses of the origin of this soil include hydrothermal activity generating sulfate-rich, hydrated deposits on early Mars similar to what is found along the flanks of active Hawaiian volcanoes on Earth. Alternatively, efflorescence, which creates the odd salt deposits on basement walls on Earth, may have contributed trace amounts of iron-sulfates over geologic time. A third key hypothesis involves acidic aerosols released at volcanic sites, such as acid fog, dispersed throughout the atmosphere, and interacting subsequently with the finer components of soil as a source of widespread hydrated iron-sulfate salts.